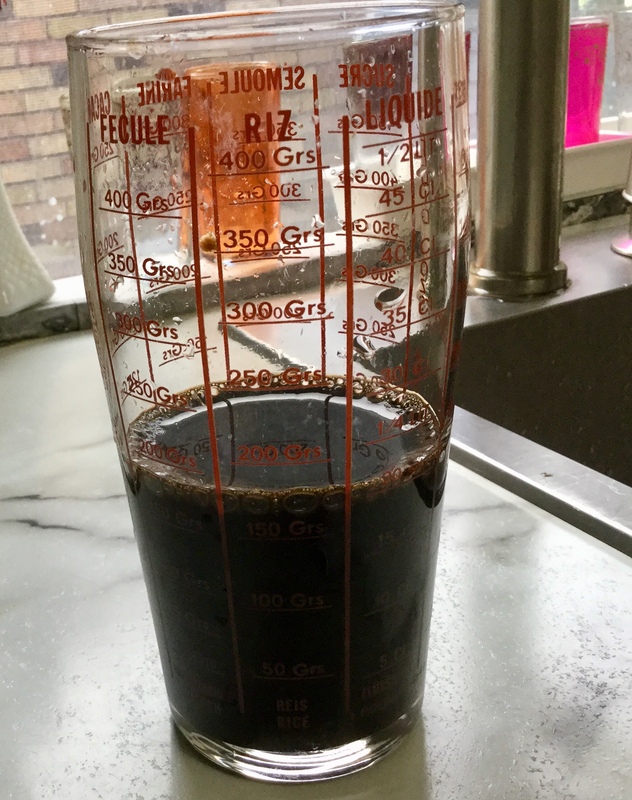 So here as promised is my update on inkmaking from my dye stash this winter – and what a winter: over 100cm of snow so far. Nothing for it but to huddle over the dye pot and carry on making ink. 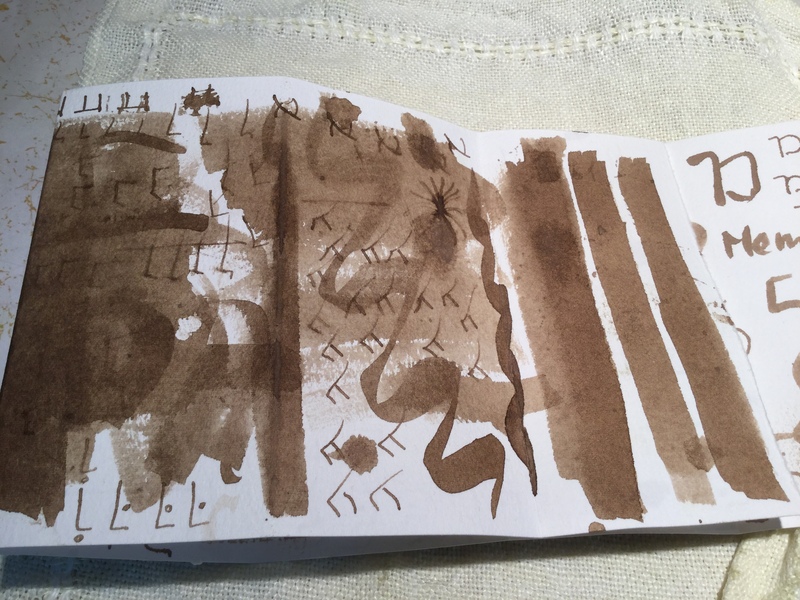 First, a little info on one of the modifiers ( or colour shifters) I used for varying the ink colours made so far with buckthorn, grape, walnut and roselle. One of the chief charms of these inks for me is the fact that they can vary in colour depending on the substrate’s pH and/or on the natural dye modifiers ( colour shifters) that the artist chooses to apply. Examples of common modifiers are vinegar ( or lemon juice), soda ash and iron. Above is the inked paper before the lemon was printed on it.The blues are grape, the browns are walnut and iron gall ink. Here are some more pics of the ink collection so far: the light yellow is what the Osage looks like when swatched before cooking. Inks swatched out on various papers. The pH of the papers can alter the colours of the inks in a delightful way! Pink roselle turns blue on certain papers as does purple grape. Inks on kozo paper which tends to keep the original colour and to mute it somewhat. (And the snow stays white no matter what) Colours L to R: Osage orange, Osage yellow, buckthorn green, rosehip red-brown, dead tulip pink, roselle pink, grape purple, walnut and grape grey, walnut brown, burnt dahlia and osage (what? ) and iron gall with sumac and walnut. Happy new year to all my readers and welcome to new readers since last post. Do you have plans for artmaking this year? My art plans for 2019 are substantially the same as in 2018: Get some art work done, Wendy. Sigh. And throw out some of that stuff in the studio. Or at least use it up. As I realized recently, there is depressingly enough dye material in my stash to colour several of Christo’s next giant wrapping installations. So I am actually quite excited to keep on filling wee bottles of ink with extracts made from the plants, powders and potions still residing in cupboard and freezer. Wow, there are some great inkmakers at play, I have discovered. I have so much enjoyed, for example, following and learning from Jason Logan of the Toronto Ink Company and Tim McLaughlin at that dye-heaven, Maiwa in Vancouver where I buy my dye stuff. Meawhile, I am truly trying hard to resist collecting any new art studio materials except for items like cute bottles to put ink in. Readers, the cute factor must be maintained even at the expense of stash reduction. 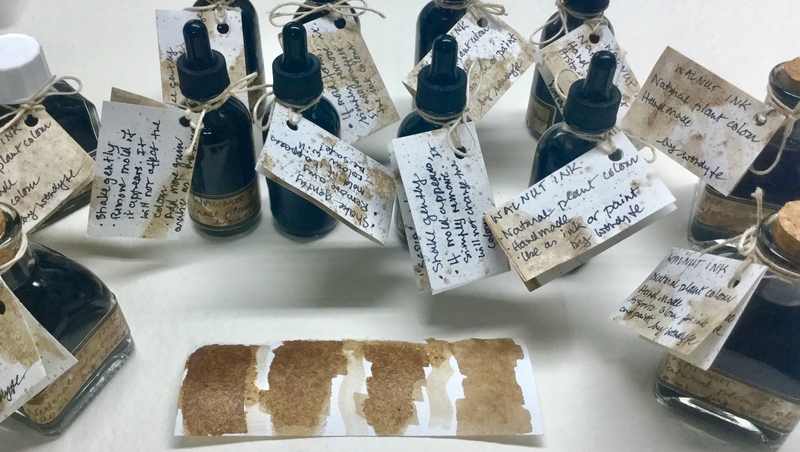 So up to now, various eccentric and alchemical inks concocted from dye plants such as walnut ( sepia brown), buckthorn (green), wild grape (purple/blue) and coreopsis (orange-red laked powdered pigment) have been bottled up in my studio. Plant inks, by their nature, are chameleon-like, meaning they can change colour depending on the acidity or alkalinity of the surfaces they land on. Natural dyers are familiar with the colour-changing actions of dye modifiers such as ammonia, iron, vinegar, copper acetate and others. Plant based inks behave similarly in the company of these modifiers. I took note that encounters with such modifiers can take place by design (the artist’s) or by chance ( the paper’s or cloth’s). So dear reader, I accept that when I make art with plant ink, I need to be resolved to let the plant ink have its way a lot of the time. Now the wee bottles of ink may want to run amok if left as they come out of the extraction process. So far, however, none has exploded or grown scary-beastie-like forms in the short weeks since they came to be. That is because they contain a little restrainting substance, in the form of a natural preservative. 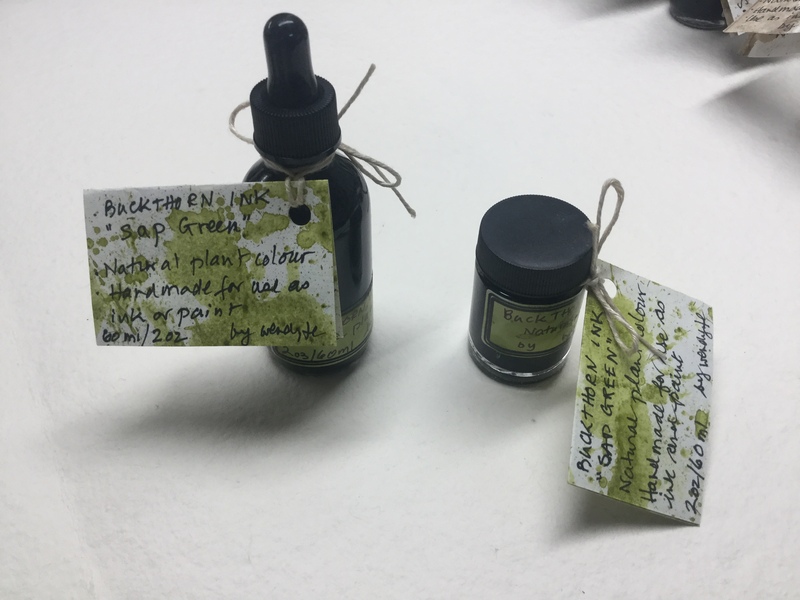 To encourage – but not guarantee – longevity of the plant colour extracts, I add preservatives such as whole cloves and/or wintergreen oil as recommended by experienced and ( please note) still living plant-ink makers. Am thinking that tea tree oil and aspirin might work, too, to extend the life of the ink and to help it stay mould-free. ( Though most inkmakers say just keep calm, remove any impertinent mould and carry on) . 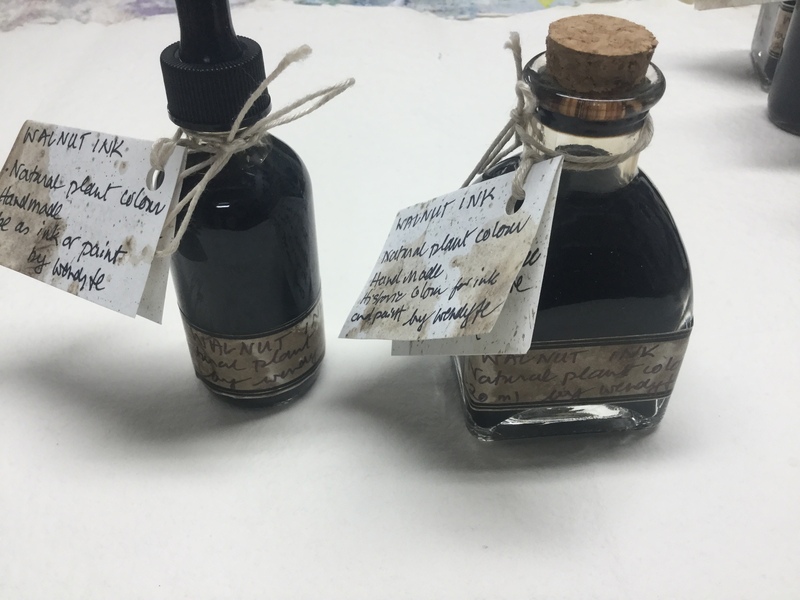 Alcohol is used by some makers as preservative but inkartists can complain of feathering when the ink is used for calligraphy and when the alcohol is present at a preservation-useful 15%. Vinegar has its uses as a preservative ( it is said) but it also lowers pH, thus can change the ink colour. Which may be what you want more than you care about how long the ink lasts) . I add gum arabic also to help flow and texture. I think it best to keep plant inks in the fridge where it is cool and dark. But that might be overkill for some. For myself, I approach inkmaking like jam or jellymaking and so sterlize the bottles and equipment. Best be upfront about this ink adventure: anything made with water and plants together will have a propensity to live its own life, if you get my drift. And now for the pictures which you may have skipped the text for.. maybe go back and read the text later? The second ecoprint bundle of folded paper cooked in the dye pot had chokecherry leaves inserted between the folds. The greens and blues are from the chokecherry. The roselle made the purple-pink around. This is how the red roselle extract colours papers of various composition. Blue for some and red-pink for others depending on the paper pH. So that is is for this post on my chameleon inks! Up next- sumac berries. I will also post a pic of my latest and re-opened references for readers wishing to have a go themselves. Blessings on the work of your hands this year, dear readers.